Today I am sharing the Instant Pot Spicy Butternut Squash Soup recipe from our new cookbook, The Gluten-Free Instant Pot Cookbook, written with Sara of My Imperfect Kitchen. The inspiration for the recipe was a meal we had at a hotel in Squaw Valley at Lake Tahoe, California. After a day of hiking the trails and visiting our favorite spots around the lake, we went back to our hotel and I ordered a bowl of the daily soup to warm up. What arrived was a steaming bowl of golden butternut squash soup, just what I was hoping for. The first spoonful was a revelation, there was a subtle spicy heat that enhanced the flavors of the squash. Just enough to taste but not so much that it burned. Even those who are sensitive to peppers will enjoy this soup. It was so good I had it again the next day! I didn’t add much heat to begin with in this recipe, preferring to let each person add more hot sauce to their particular taste. I always pass a bottle at the table and everyone can customize their bowls of soup to their liking. I have made different variations of vegetable soups for years including one I called Jack O’Lantern Soup specifically for Halloween. It is a combination of my favorite black bean soup on one side of the bowl with sweet potato/carrot soup on the opposite side, creating an orange and black yin and yang presentation that everyone has fun with! I hope you have a chance to make today’s Instant Pot Spicy Butternut Squash Soup soon. It is guaranteed to chase away any chills and will warm you to your toes!! Welcome to Progressive Eats, our virtual version of a Progressive Dinner Party. This month features a bunch of recipes for winter squash, and one for a perennial favorite of summer squash that’s good to have in your back pocket all year long. Our host this month is Susan who blogs at The Wimpy Vegetarian. We have a great mix of recipes including appetizers, sides, main courses, and dessert. Make sure you check out the links below the recipe. Place the squash in the microwave and heat for about 1 minute. This softens the rind and makes it easier and safer to cut. Using a large, sharp knife, cut the squash into quarters, scrape out the seeds and strings, and peel the chunks. Cut into cubes. Press Sauté on your Instant Pot and add the oil to the inner pot. When it is hot, add the shallots, celery, carrots, and thyme and cook 4 minutes, stirring often, or until softened. Add the garlic and cook for 30 seconds. Add 1 cup (235 ml) of the stock to the pot, scraping the bottom to release any browned bits. Add the remaining 2 cups (470 ml) stock, maple syrup, salt, pepper, hot sauce, and butternut squash. Press Cancel. Close and lock the lid, making sure the steam release handle is in the sealing position. Cook on high pressure for 9 minutes. When it is finished, release the pressure naturally for 10 minutes, then release the remaining pressure by turning the steam release handle to venting. When the pressure valve drops, unlock the lid and open it carefully. Check to make sure the squash is fork-tender. If it needs more time, replace the lid, return to pressure, and cook for another 2 or 3 minutes. Use an immersion blender to puree the soup right in the inner pot, or transfer half of the soup at a time to a blender and puree in batches. Taste the soup and adjust the seasonings as needed. If the soup is too thick, add a little more stock or water. Ladle into serving bowls, sprinkle with the parsley or garnish with thyme sprigs, and serve hot. If you’re unfamiliar with the concept, a progressive dinner involves going from house to house, enjoying a different course at each location. With Progressive Eats, it’s a virtual party. A theme is chosen each month, members share recipes suitable for a delicious meal or party, and you can hop from blog to blog to check them out. Come along and see all of the delicious fall dishes! To see our upcoming themes and how you can participate, please check out the schedule at Creative Culinary or contact Barb for more information. Oh I just love the yin yang bowl – I have to try that! And yay for the spicy sauce!! Isn’t that a fun idea Beth?! I loved the way it turned out and used two of my favorite soups from the new cookbook! The hot sauce is a fun way to spice up any soup, but is especially unexpected in butternut squash soup – and a fun surprise! 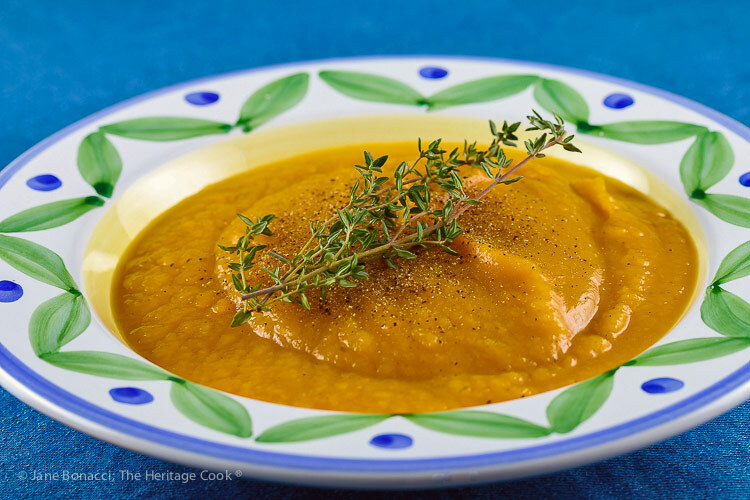 I can’t get enough butternut squash soup in the fall and winter! This looks great and so easy with the Instant Pot. Love that you added some heat! I am SO happy that you are comfortable using your IP now Laura! That warms my heart!! This soup would be perfect for your blustery and wet days, I hope you love it like we do! Such a gorgeous bowl of soup! I love the other veggies in there too to balance out the squash. Pass the Sriracha please! Such lovely autumn flavors! I can see this as a starter on Thanksgiving day!